Upgrade Classic Template without the "UPGRADE YOUR TEMPLATE" button. ~ The Blog Doctor. You are here: Home > Upgrade > Upgrade Classic Template without the "UPGRADE YOUR TEMPLATE" button. Upgrade Classic Template without the "UPGRADE YOUR TEMPLATE" button. "I would like to change my 'Template' to 'Layout' but on the tab 'Customize Design' I don't even see the button of 'Upgrade', what should I do? " Blogger blogs have either Classic Templates or Layouts with widgets/gadgets. Classic templates are retained by those who wish to have the Ye Olde Blogger look. Layouts are preferred by those who do not want to be bothered too much with code and want a click and drag graphical user interface. Many bloggers have reported the abscence of this button and hence the inability to upgrade their blogs to layout templates. 1. First Backup your blog to be on the safe side. This can be done using the export-backup function or the old backup method. 2. Backup blog Template using select-all-copy-paste from your Template Code box (Template---->Edit Html tab) to a Notepad file and save it on your disk. Copy the BIG_NUMBER at the end of the address/URL. Replace BIG_NUMBER with your BlogID Number you copied in Step 3 above. Hit Enter key on keyboard. If you have followed all steps correctly the Select New Template tab will open. Select your template and click the "Save Template" button. Thank you for providing an easy-to-follow answer to a problem that I have spent a bit of time trying to figure out on my own. I've been reading so many posts about this and they keep saying 'press upgrade' button - in actual fact no such button exists. I tried this method and it works perfectly, thank you thank you!!!! Thank you so much! I was in tears when I messed up my blog. You have saved me! Thanks!!! I am so excited to have my blog back to the way that I wanted it. You are awesome! I upgraded and now my postings are in HTML format. When I add a picture it's in HTML so I can't see it and move it around. Also, after I upgraded, the way I have my blog setup on Layout isn't what is seen on my blog. My column on the right is now at the bottom of my screen. Can you help? Thank you for the instructions BUT they don't work for me. I see the templates, but when I click Save, I get bX-6xyj9. I have filled out the bX form and will let you know what they say. To see the picture in Post Editor click the Compose tab on upper right corner of Post Editor. To see the Layout properly you will have to modify the Layout Editor Wireframe code in CSS part of the template. The bx errors are connectivity errors. Try connecting at less busy times or from a broadband connection. ALSO CLOSE ALL OTHER APPLICATIONS AND BROWSER WINDOWS AND TABS. Sweet - thanks for this. I wanted to try and add a flickr badge to my new layout, but after trying to revert to the old templates I royally screwed up what my blog looked like. Anyhow - thanks for very clearly explaining how to get around the fact that the "Upgrade your Template" button was missing. You will have to Upgrade to Layouts template to get it. Code is not available for classic template. The bx errors are NOT due to errors in template code. Have a look at Blogger Error Codes. Thank you, thank you! This was the most helpful and easy to follow instructions I have ever had (for a new blog user). Thank you. VIN, thanks for your effort but I regret that BX- error should not be for connection, at least, not for my connection, my broadband works perfectly and the broadband on my working place as well. I always get this horrible BX-error, so there should be another solution (or not) however yours doesn't work properly. dont you have any other idea, please? I'm getting crazy. I follow the steps you wrote but it when I hit 'Enter', it brought me back to same page without the Upgrade button. First clear cache and then follow above procedure. hey, dude...it's working!! u r good!! Thank you so much! I thought I had lost everything. I didn't have the upgrade your template button (or whatever it was). You made me smile today! Hmmm... but what if I want to make my blog dangoorevitch.com instead of dangoorevitch.blogspot.com? Can't I only do that in a classic layout? First step is to buy dangoorevitch.com if it is available. Then you can redirect your blogspot blog to it using Custom Domains facility. 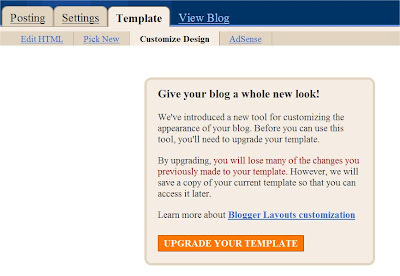 You can continue to use Layouts Templates since the blog continues to be on Blogger servers. http://dangoorevitch.com/blog/ than that is a FTP blog and you will have to use Classic Templates. Wow! And it only took me 5 hours to find your site and fix the problem. Thanks so much!! Thanks Vin. I already own it and it's on an iPowerweb server right now. I'll have to switch it over to Blogger and buy it from them. Thanks Vin! Thanks a lot!!!! you're heaven sent!! It worked, I can't thank you enough, I thought I lost everything! I also had the same problem.but it was fixed. Thank you very much for your teaching! Thanks Vin...all I wanted was to change my template design, and I ended up with a HUGE mess. At least I know that I'm not the only on e with this problem!! I am going to use your "fix it" method!! I have spent hours trying to figure out how to get the new layout feature (missing the Upgrade your template button like everyone else), read your posting, the discussion thread, done everything, including clear the cache. I am also using a very fast broadband connection. NO LUCK THO. Only thing I have not tried is downloading and trying firefox as a browser. Seriously, I have yet to see a legitimate solution for the bx-errors. Close any other applications using the connection concurrently besides using Firefox. I did this but it only took me to the pick new templates page. I could get there on my own really easy. I need to change from template to layout. I have been working on this for over a month and can't get it done. any help? I've been blogging for almost three years now and I think my blog also experienced the Blogspot transition phase. I couldn't remember whether I've upgraded my page using the 'upgrade button' or not, but until now whenever I create a new posting, there's no "Title" box appearing anywhere. I've created several blogs in 2007 and they don't have this kind of problem. My blog address is: www.dee-idea.blogspot.com, as you may see later, all titles of my posting don't have its own box. I have to write them altogether with the rest of the text. Could it be because I haven't upgrade my lay out yet? Or is it something else? Anyhow, I've tried the steps you instructed, and got BX error. Thank you in advance. Badly need help, Vin. In your blog go to Settings---->Formatting---->Show Title Field---->Yes---->Save. The bx errors are connectivity problems and have nothing to do with code. I've had a blog since 2004 with some customized graphics and details, and am terrified that if I try to upgrade, I'll never get it looking how I want and won't be able to go back. IS IT POSSIBLE TO REVERT TO CLASSIC after upgrading? How does one do that? I do have another blog with the new layouts and find it very difficult to control elements. Is it worth upgrading? You can revert to Classic template at any time. The learning curve is not so steep for Layouts which may seem difficult at the start. You can customize Layout template to look like old classic template. can i also upgrade my template but keep my current theme whch is not a xml code? Copy present Classic template and paste in a Notepad file and save as backup. You can Revert to Classic Template at any time. Hi There, hope you can help . I've been meaning to upgrade my blog to "new" layouts for a long time. The first attempt was a big mess, because all the blogs in the blogroll got added into one huge long list rather than separate list. So I gave up and carried on with the old style. Now when I try to convert again it still gives me the same, very old first version I had when I tried to convert. Is there anyway to throw away that first aborted attempt to migrate to new verision and trick Blogger into thinking this is a first time Upgrade and convert the current version of my blog into the new version. Let it upgrade into whatever. You can always customize it to what you want. First copy your Classic template to Notepad and save it. Let me know after upgrading what you want to keep and what you wish to delete/change. OK I upgraded. I want to have all the 100 blogs and links I just had, in the same lists I had. Not the short list of 50 old links in a random order. I've followed this guide and get error code after the last stage. I've had a read through the comments sections here and haven't any mention of this one. The code I get is 'bX-l2vlm7'. I'm fairly sure there's no connectivity issues as I'm on decent broadband and everything else has been fine during my browsing. Increase browser cache memory in browser settings. Close all other open windows or browser tabs. Increase virtual page file in windows settings. Increase physical RAM in computer.